My lovely friend JK, who is as much a foodie as I am, liked the idea of trying Fig Bistro in Barnsbury when I suggested it. She often drives past the restaurant, which with its candlelit window, looks cosy and romantic. I’ve never been past the place but I liked the sound of it because Chef Christoffer Hruskova’s CV read well. Having spent a year at King Hans, Denmark’s longest running Michelin starred restaurant, Christoffer embarked on a worldwide culinary tour, taking in kitchens such as Tetsuya’s in Sydney, one of the ‘50 Best Restaurants in the World’, and the now closed Patria in New York City which I use to love when I lived in NYC. The restaurant is as cute as JK described. It’s warm and homely with brick walls and woodwork furnishings. But our meal got off to an unpromising start. Our waitress had no idea what was in the Cornish charcuterie, one of the starters on the menu. She sent another waiter around to answer our questions, but he was also unable to tell us what was in the Cornish charcuterie or how a main course of Herdwick lamb rump Provencale was cooked. I was floored that the waiting staff at a restaurant could be that ignorant about the dishes on a menu, especially one as short as this (about 5 to 6 options per course). 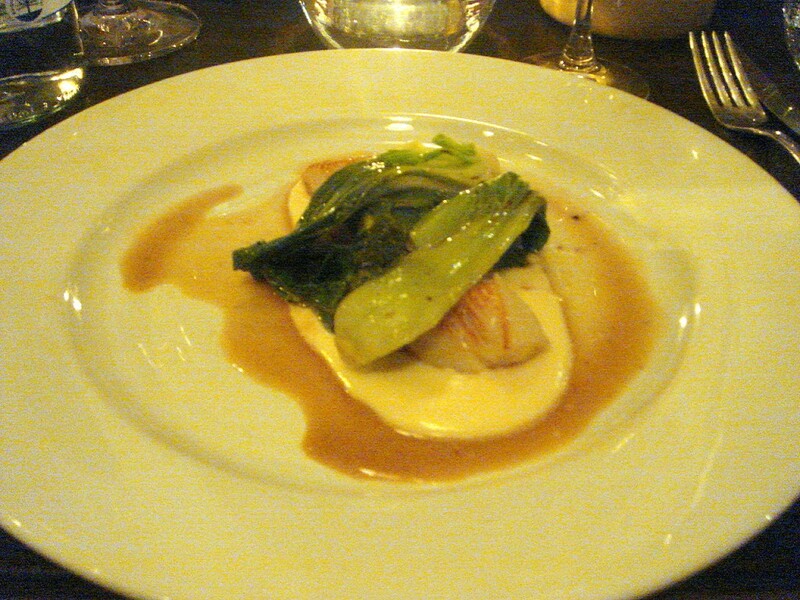 For starters, I decided to go for the pan-fried scallops and cauliflower (£8) which was part of the ‘Bistro Special menu’ (4 courses for £35). Initially the waiter declined to let me order it (as it was part of the set menu), but with a gentle nudge he finally relented. Well, I wish he had been more insistent at saying no because the dish was pretty bad. The scallops were under seasoned, overcooked and rubbery in the way scallops become when they’re not fresh. The cauliflower puree was runny, too creamy and had very little flavour of cauliflower. The presentation was poor and I also didn’t understand the point of the bok choy garnishing. Not only did it taste at odds with the scallops as it was too acidic, it also hid the four tiny scallops – the star ingredient – underneath it. The serving plate was also cold. 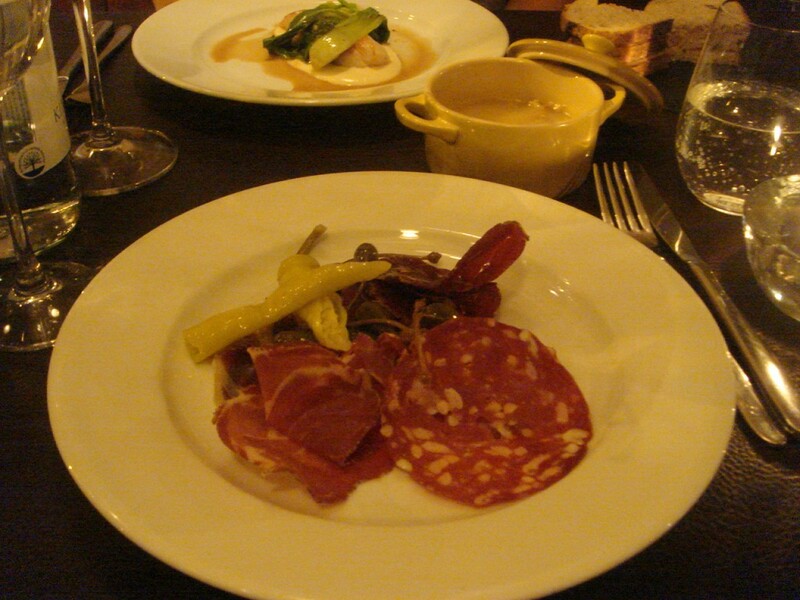 The Cornish charcuterie (£7.50) included salami, coppa, bresaola and caperberries. A nicely presented dish, it looked better than it tasted. The meat was average and the caperberries were too soft. Duck rillette served in a separate dish was under seasoned and submerged beneath some duck fat which hadn’t set. The result was that whenever you spooned up some rillette the fat ran through it leaving a big fat taste of fat. The serving was generous though, and the sourdough bread was lovely even if it was unevenly grilled. 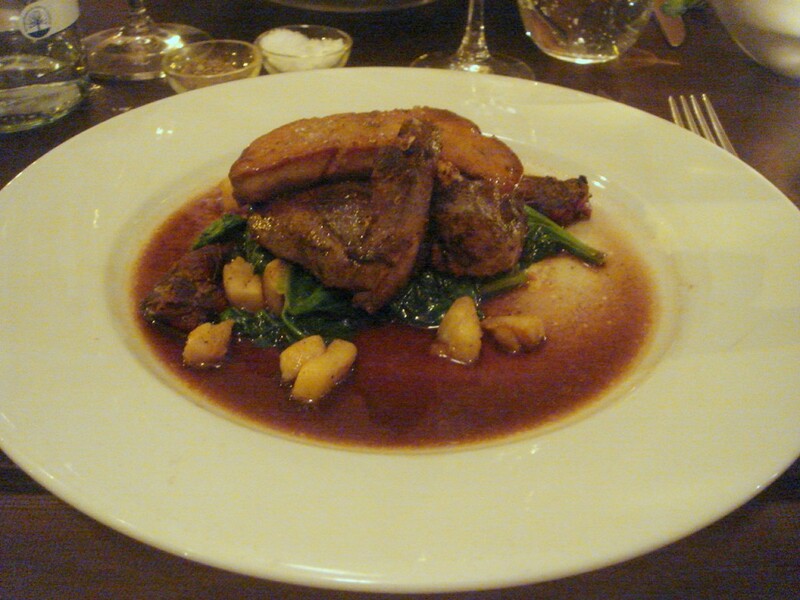 A main of roasted wood pigeon with pan-fried foie gras (£17) was cooked nicely, although the legs were overcooked and dry. The meat wasn’t chewy per se, but it was quite tough. It wasn’t the best pigeon I have ever had, but the foie gras was delicious and silky even if more seasoning was required. There were some pan juices which didn’t have the intensity of flavour required of a good jus, and the accompanying salt baked celeriac was overcooked to the point of mushiness. Pan-fried wild seabass with artichokes, fennel and black olive sauce (£14.80) was under seasoned and overcooked. The presentation was sloppy, and I would have preferred a crispier finish on the fish skin. A side dish of purple sprouting broccoli which should have had some bit to it was overcooked and mushy. We ummed and ahhed about whether to have dessert. Our poor starters and mains didn’t bode well for a good dessert. But we decided to share a chocolate fondant with rum braised pineapple and vanilla ice cream (£6.50) which was rather nice. The centre was still runny, although the pineapple seemed at odds with the chocolate. A berry combination would have worked better. The menu reads well, and the restaurant looks nice, but that’s where the positives end. This was evident in the incorrect seasoning, poor ingredient selection and tardy execution. The sloppiness seeped all the way through to the service. Waiting staff should know their menu better than this lot did. The dry stores room was also next to the loo downstairs which JK really didn’t like. Somehow I couldn’t help but feel that the Chef is someone who, with the type of restaurants he has spent time in, has the skill and knowledge to cook well but has lost the passion to do so. In some respects this is more disappointing then someone who doesn’t know how to cook. It’s very sad indeed, but the result is the same – bad food. Price range: £30 to £33 per head, excludes drinks and service. Thanks so much for taking the time to comment on my post. I did hear that Chris opened up a new restaurant, but the fact that I ended up eating at Fig around that time was purely coincidental. I think the points you raise about valid and I can see how a chef missing in action, ie, someone who is opening a new restaurant can lead to issues in the kitchen. But equally I think a restaurant should pride itself on consistency. Too often I go to a restaurant where the head chef isn’t cooking and the standards aren’t up to scatch. This is disappointing not only because I’ve had a bad meal, but also because the cooking doesn’t live up to the reputation of the chef, this being one of the likely reasons behind why I might have chosen to go to the restaurant in the first place. But I will give your suggestion about going to try it again some thought thought, perhaps to North Road this time. I’d like to be proven wrong. Thanks again for contacting me.